The New York state Health Department shut down an upstate lemonade stand run by a 7-year-old after vendors at a nearby county fair complained he was undercutting their price, reports The New York Post. 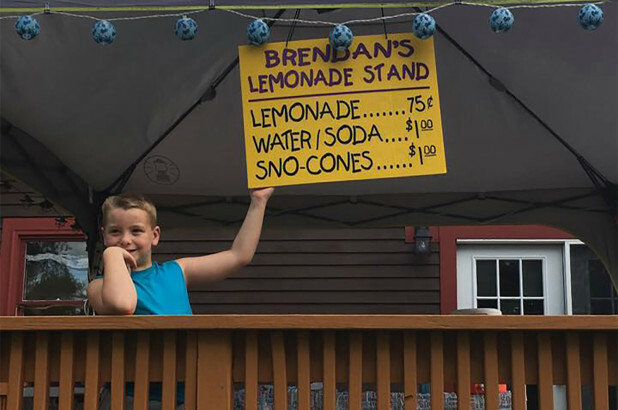 Brendan Mulvaney was selling lemonade, water and Sno-cones from the porch of his family’s home, which happens to be right outside the Saratoga County Fair, when a woman wearing a Health Department T-shirt turned up Friday and ordered it closed because the family had no permit, reports NyPo. At first, officials said they couldn’t explain what happened because the Health Department doesn’t regulate lemonade stands. The agency even issued an apology. confirm the inspection was performed by DOH staff and the surrounding circumstances, we offer Brendan an apology for any inconvenience,” said spokeswoman Jill Montag on Sunday. NyPo reports that twenty-four hours later, the bureaucrats did an about-face and said a permit is required after all. “In the opinion of the inspector, the lemonade stand was in line with vendors inside the fair. She did not see any child,” a second spokesman, Gary Holmes, told The Albany Times-Union, which first reported the story. Brendan was charging 75 cents a cup for pre-mixed lemonade, while fresh-squeezed at the fair was going for about $7. State Sen. Jim Tedisco (R-Saratoga) visited the kid’s stand Sunday afternoon and said the government had gone haywire. “There’s nothing that says America more than apple pie and kids running lemonade stands,” he said in a statement. “What has our state government come to? All I want to know was where was country time???? This kid should give some AR-15s to some illegal immigrants to open carry, then hire them as security to ward off the local gangsters and not report any of it to the IRS. Illegal immigrants open carrying? That's called MS-13. I disagree with Tedisco. A good old fashioned tax rebellion is more American. In the not-so-distant future, I foresee ammo stands being very popular. As Rothbard noted in a different context, the whole "safety" argument is belied by the fact that the state doesn't go around shutting down the serving of lemonade for free. It's only when you compete with the state's cronies for consumers' dollars that you get in trouble. Not yet. Or actually, they do shut down even free distributions in some places.